The Maldives has fallen to 112th place in the Reporters Without Borders (RSF) Press Freedom Index for 2015, dropping four places and marking a significant decline for the fourth consecutive year. RSF annually ranks the performance of 180 countries according to a range of criteria, including media pluralism, independence, respect for safety and freedom of journalists, and the country’s legislative, institutional and infrastructural environment for the media. Last year saw numerous death threats sent to journalists, the disappearance of Minivan News journalist Ahmed Rilwan, and a machete buried at the door of the Minivan News office. Speaking to Minivan News, Maldives Media Council (MMC) member Miusam Abbas contended that the decline in the press freedom index reflects the government’s restrictions on the media. “The government has been pushing to restrain the media in so many ways,” he alleged. Miusam suggested Rilwan’s disappearance was the biggest factor in last year’s decline. Rilwan is believed to have been abducted at knifepoint at 2:00am outside his apartment in Hulhumalé. Human rights NGO Maldivian Democracy Network released a report in September implicating radicalised gangs in Rilwan’s disappearance. Home Minister Umar Naseer has also acknowledged involvement of criminal gangs in the case. “It is a shame that the government has absolutely done nothing of relevance to find the journalist Ahmed Rilwan. I interpret this as a threat to the media in Maldives. After all, how can a journalist truly be free of fear while reporting when one of their colleagues has been missing for months?” Miusam asked. Miusam also accused the government of actively assisting newly formed pro-government media outlets whilst deliberately recruiting journalists from other independent news organisations. “This is an act to deliberately ruin targeted media organisations,” he claimed. An environment where journalists could report freely in news organisations that were not financially dependent on politicians is essential for press freedom to flourish in the Maldives, Miusam said. “If we look at the big media organisations now we can see that they are either funded or owned by a politician. The only solution I see is for the media to run as normal business without the backing of politicians or politically influenced organisations,” he explained. Following the attack on the Minivan News office last September, Foreign Minister Dunya Maumoon expressed “deep concern” with the increasing intimidation and threats faced by journalists. “Even now in newspapers and TV channels they are talking about various matters. Regarding the government or responsible officials in the government, they are saying there are people in the government who have committed various crimes,” he said, adding that the government would not order investigations or respond with litigation. Yameen’s remarks came shortly after his administration faced criticism over the absence of either the president or a cabinet minister at a ceremony held to mark World Press Freedom Day, which saw the introduction of the first Maldives Journalism Awards. Prior to the country’s first multi-party democratic election in 2008, the Maldives was ranked 104th – an improvement on its 2007 ranking of 129th. The country’s ranking in 2009 and 2010 reflected dramatic improvements in press freedom – including decriminalisation of defamation – rising to 51st and 52nd respectively. However, the Maldives slid to 73rd in 2011, 103rd in 2012, and 108th in 2013. In February 2013, opposition-aligned private broadcaster Raajje TV reporter Ibrahim ‘Asward’ Waheed was nearly beaten to death, while the station’s offices and equipment were destroyed in an arson attack in October. In June 2012, two men slashed the throat of freelance journalist and blogger Ismail Hilath Rasheed with a box cutter. Three Scandinavian countries – Finland, Norway, and Denmark – topped the RSF index while Turkmenistan, Eritrea and North Korea were the worst performers at the other end of the scale. 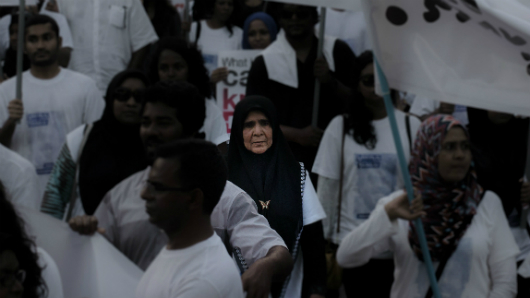 Aminath Easa, 67, is the mother of missing Minivan News journalist Ahmed Rilwan. She has led the search for her son, appearing on the frontline of marches and efforts to lobby the government and politicians. Rilwan is the youngest of her nine children. Zaheena Rasheed: Tell me of the last time you saw Rilwan. Aminath Easa: He came home, and ate with me before he went to Hulhumalé. He does not answer his phone during the weekend. He always tells us he wants to sleep, do chores, do his laundry. We don’t call him during the weekend. People say we took too much time to report him as missing. But we started looking for him as soon as we could not reach him. Of course, we did not call him during the weekend. But at the start of the week, we called his friends. We were concerned, we went to his apartment. From that day on, for the past five months, we’ve been looking for him without rest. God willing, I will do everything in my power to find him, with patience, until I die. I will not stop, no matter what anyone says. ZR: What do you think of the government’s response? AE: I am not at all happy with the government’s response. I know the police are capable, they have solved cases they work on. They caught the two dangerous convicts who escaped from jail, without firing a single shot. They work when their leaders tell them to. But the government hasn’t told them to find my son. The police will look for him and find him if their superiors order them to do so. I believe government officials are complicit in this case. I said so to [Home Minister] Umar Naseer. Why has President Abdulla Yameen refused our request for a meeting? We are his citizens. It is his citizen who has been abducted. We would receive some satisfaction if they would just meet us. But the two Presidents [President Abdulla Yameen and former President Maumoon Abdul Gayoom] refused to meet us. Yameen’s wife refused as well. This is how poor, how helpless we are. I have always struggled in my life, but I have never had to face such fear, such sadness. But we will continue to lobby them. I will continue to request them to find my son. People tell me, you are so brave, if it were me I wouldn’t be able to get up, I tell them, how can I lie down? Should I give up hope, wait til I die, saying he is gone, that he will not come back? That will not do. I must work with my family, as a mother, I must give my children courage. If I lie down, they will have to look after me as they look for him. There is no one else. We are calling on the public to help us. The government does not help us. ZR: How has the long search affected your family? AE: My children are looking for him 24/7. His brother was recently very sick, he collapsed in December and had to get tests done abroad. Doctors told him he was under too much stress, to stop thinking. But how can he? I too worry. But I do not cry infront of my children. I do not let them know. I do not cry in front of my friends. But when I am alone in my room, I cannot help but cry. I pray to Allah to grant me patience. Allah will grant me patience. I have never borne such a pain. I have looked after nine children by myself. I do not have family, just a half brother. He is quite old now. I do not have anyone but my children and God. My children are very good to me. ZR: Tell me about your daily routine? How has it changed since Rilwan disappeared? AE: I was never one to stay at home. In this day and age, people no longer visit their neighbors, but I do. I wake up at dawn, do my prayers, go for a walk around Malé, and go to yoga. Then I cook, and after lunch I visit my friends till Asr prayers. After performing Asr prayers, I visit my neighbors again until dusk. But I no longer want to visit the houses I used to. They speak about Rilwan. They ask me, what happened to him? They tell me he must have been killed. This is what most people say. So I do not want to see people any more. I have changed a lot. I spend a lot of time alone, at home, with my children and praying to Allah to bring my son back to me. ZR: Your family has consulted clairvoyants? What are their predictions? AE: We have consulted astrologists. But there is no certainty in their predictions. They tell us he is alive, but that he will not come back to us anytime soon. We tell them, we know that. He can only come back when those who are holding him let him go. Umar Naseer told the media once that we will know what happened to Rilwan when he comes back, whether he was abducted, whether it was a voluntary disappearance. I went and met [Naseer] afterwards and I questioned him, why are you saying this? Yes, when he comes back we too will ask him, where have you been? Who took you? Why must the government ministers speak like this? The government is not working on this at all. At all. And so we must continue lobbying, pressuring the government. This is our work, this is what we must do. ZR: Are you hopeful? From whom do you draw your strength? AE: I have hope. I have never given up hope. As long as I live, until I die, until we find him, I will continue. I will continue. Even if its just me and a handful of family members and his friends, I will come out and march on the streets. I will go even if no one goes. Some people have said the turnout was low during the second march. I say, I do not mind, we will continue. But we will invite everyone to join us, for the sake of humanity. ZR: What does Rilwan’s disappearance say about peace and security in the Maldives? AE: There is no peace and security for anyone. When I go for my daily walk, I am scared. But Allah has ordered us to keep in good health. That is why I go, even though I am quite old now. I go alone, I walk all around Malé. Sometimes I look back in fear. Before this, I was never afraid. I am afraid now. ZR: There have been over 33 deaths in the past seven years. Many families have lost their sons and daughters. What is your message to them? AE: To families who have suffered injustice, I want to say, why do you remain silent when your children have been murdered? Who are you afraid of? Your government? Allah? Do not fear. Allah has ordered us to keep trying, to continue in the face of hardship. My son has been disappeared, and I will do all I can, without rest, to find him. Your sons have been killed. If you remain silent, another’s son will be killed. And this cycle will go on. If families had demanded justice with the first killing, we would not be where we are today. Every day, there are more knifings, more death. These families who have suffered, they are afraid to stand up, they fear our leaders. We were not allowed to speak our minds before, and I am afraid the same day has returned. My heart does not say my son is dead. But everyone else believes he is dead. He can only come back when those who have him release him. Friends and family of Rilwan will gather outside of the Hulhumalé ferry terminal, in Malé, this afternoon at 4:30 to celebrate his 29th birthday. All are invited to come and write a message for Rilwan on the 163rd day since his disappearance. The Criminal Court has released the last remaining suspect related to the disappearance of Minivan News journalist Ahmed Rilwan from house arrest (December 1). A police media official told Minivan News that the suspect was released after the criminal court deemed it was unnecessary to keep him under house arrest any longer. The suspect was kept under house arrest in relation to what is believed to have been an abduction at knife-point from outside Rilwan’s Hulhumalé apartment on the night of August 8. Rilwan’s family and local NGO Maldivian Democracy Network (MDN) have filed two separate cases at the Police Integrity Commission (PIC) accusing the police of negligence in the investigation. An MDN commissioned private investigation by a UK based security firm outlined several lines of inquiry into the disappearance with pointing out radicalised gang related abduction as the most likely explanation for the disappearance. The People’s Majlis on Tuesday threw out a 5055 signature petition which urged the parliament’s National Security Committee to pressure the Maldives Police Services to conduct a speedy and thorough investigation. In a letter to MP Imthiyaz Fahmy, who sponsored the petition, Majlis Secretary General Ahmed Mohamed said the petition had failed to fulfill requirements outlined in the Majlis standing orders. Condemning the move, the opposition Maldivian Democratic Party (MDP) MP said Secretary General Mohamed had later admitted the rejection of the petition was “a mistake” and confirmed it had been submitted according to all procedures. “We are extremely concerned. The MDP submitted the case to various subcommittees. Ruling party MPs killed the case in every single committee, and have now killed the 5055 signature petition submitted by Rilwan’s family,” Fahmy MP said. The Majlis secretariat had said the sponsoring MP had not signed all pages of the petition as Article 200 of Majlis regulations. However, Fahmy pointed out his signature was in fact present on all pages. Article 199 the Majlis standing orders state a petition can only be submitted on a bill submitted to Majlis, an issue taken up in Majlis, or an issue of public concern. Fahmy’s urgent motion on Rilwan’s disappearance on August 19 was accepted with bipartisan support. “When I countered all of their arguments, they at last said it was a mistake. All the required signatures were there. Then, not knowing what to say, they said we will try to proceed. What kind of answer is this?” the Maafannu North MP said. Despite public outcry, the PPM has largely remained indifferent. Today is the 81st day since the reporter disappeared. The petition, submitted on September 4, asked MPs to investigate if the police had been negligent in investigating Rilwan’s disappearance and asked MPs to find out if an abduction reported on August 8 in front of Rilwan’s apartment building was connected to his disappearance. Four men have been arrested over the case, but only one man remains in custody at present. The police have only revealed few details on the investigation. Home Minister Umar Naseer said he believed Rilwan is alive and promised to return him safe to his family. He has also acknowledged involvement of criminal gangs in the case. Human rights NGO Maldivian Democracy Network released a report in September implicating radicalised gangs in Rilwan’s disappearance. Discounting theories of voluntary disappearance and suicide, the investigation – conducted by Glasgow-based Athena Intelligence and Security – concludes the disappearance is likely to have been an abduction. The report confirmed evidence of possible “hostile surveillance” at the terminal conducted by two known affiliates of Malé based Kuda Henveiru gang. The NGO on October 23 accused the police of negligence in investigating the disappearance for their failure to inform the public on progress and failure to confirm if the abduction reported on the night Rilwan went missing was related to his disappearance. Former Deputy Speaker and Dhiggaru MP Ahmed Nazim reportedly left the Maldives for Malaysia the same night that travel restrictions were placed on him following a Criminal Court order. Haveeru reported that Nazim left the Maldives last Wednesday night (October 22) while the Criminal Court issued an order to immigration authorities to withhold his passport on the same night at 9.45pm. Police confirmed that Nazim’s passport has been held but refused to give any further information as to why the passport was held in the first place. An independent report into the disappearance of Minivan News journalist Ahmed Rilwan also mentioned the Dhiggaru MP’s name, alleging that Nazim had attempted to implicate the tourism minister Ahmed Adeeb in the case. The report by private UK-based intelligence firm suggested that Nazim had promised to provide a journalist with information linking Adeeb – also deputy leader of the PPM – with corruption if he could be linked to the disappearance of Rilwan. The home minister has acknowledged gang involvement in the disappearance of Minivan News journalist Ahmed Rilwan, while accusing politicians of obstructing the investigation. “We already knew that there is a gang connection to Rilwan’s case. However, in a modern investigation, one doesn’t immediately arrest suspects. We leave them free and follow them and gather information,” he explained during an interview on state television yesterday. “The biggest cause of obstruction to this investigation is the MDP [Maldivian Democratic Party],” Naseer said, accusing the opposition party of being behind a private investigator’s report released by local NGO Maldivian Democracy Network (MDN). Rilwan was last seen on CCTV footage at the Hulhumalé Ferry Terminal in the early hours of August 8. Friends and family have alleged his disappearance to have been an abduction, based on evidence in CCTV footage and eye witness accounts. The MDN report, produced by UK based private investigators Athena Intelligence and Security, implicated gangs – possibly motivated by religious extremism – in the disappearance 73 days ago. “The release of the report forced us to change our investigation technique. We had to hurry the arrests, which led to early release of suspects. It is the biggest hindrance to the investigation so far,” said Naseer. Four individuals were arrested following the report’s release, though three were later released. The minister said that the report had named some suspects who are members of notorious gangs that the police had also already identified. MDN maintains that the report was released with the objective of aiding the police in the investigation. Police have yet to confirm the nature of their investigations, stating that they have gathered no “concrete evidence” linking Rilwan with a reported abduction outside his apartment the same night. Naseer concluded his remarks on Rilwan by stating that he believes the 28-year-old remains alive as the abductors have so far left no indication that they have taken his life. Rilwan’s family has continuously expressed concern regarding the lack of information received from the police regarding the investigation’s progress. Police Commissioner Hussain Waheed went on the offensive last week, telling local news outlet Vaguthu that the family and certain media organisations were partially responsible for the lack of success in the investigation. Naseer yesterday dismissed the family’s concerns, saying that police were giving regular updates to the family, and that he had personally met with the family at least four times to share information. “I personally meet with the investigation team once a week and get an update on progress. I also give them advice on how to proceed with the case,” Naseer said, adding that the government sees the disappearance of Rilwan as a high priority. President Abdulla Yameen has yet to comment publicly on the case, beyond his dismissal of questions regarding the case in August, although the foreign ministry has expressed concern. Naseer went on to say that, despite spending state resources, funds, and time on the case, the police have so far been unable to get any answers in the case. “I must say that sometimes things just happen this way, we just don’t get ahead. For example, consider the Malaysian Airlines flight MH370 which disappeared with over 200 passengers. The whole world is looking for it, but no one has a clue as to where it may be. And then we are talking about one man, Rilwan,” he said. “Things and people that go missing are sometimes just not found easily. We can use all the available resources in a country and even then, there is only so much we can achieve. However, in this case, we have not given up and will continue trying,” Naseer continued. Umar also dismissed allegations of police negligence involved in the case. When questioned about police actions following the reported abduction near Rilwan’s residence on the night of his disappearance, Umar said people were speculating that it is police negligence “due to the lack of information they have”. He affirmed that police had promptly investigated the matter, even without knowing at the time whether it was related to Rilwan’s disappearance. Naseer also dismissed allegations of state involvement in Rilwan’s disappearance. “This is MDP’s way of comparing this case with that of Ablo Ghazi [Criminal Court Chief Judge Abdulla Mohamed]”, he alleged. “No one has forced Rilwan’s disappearance. Ablo Ghazi was abducted by the MDP government with the aid of the MNDF. Rilwan is someone who disappeared and we are trying to find,” he explained. “We are considering the disappearance of Rilwan as a criminal act and are investigating it to the best of our abilities,” he assured the public. The Maldivian Democratic Party (MDP) office on Sosun Magu in Malé was set on fire around 12:45am last night amid escalating tension in the capital. The arson attack follows vandalism of the main opposition party’s office for two consecutive nights and numerous death threats sent from unlisted numbers to MDP MPs, senior members and dozens of journalists. Eyewitnesses told local media that petrol was poured into the ground floor of the office through the smashed up windows before a lit molotov cocktail was hurled inside. A second lit molotov cocktail fell outside the door. A team from the fire and rescue service of the Maldives National Defence Force (MNDF) arrived shortly after the incident and extinguished the flames. The damage caused by the fire was reported to be minor. 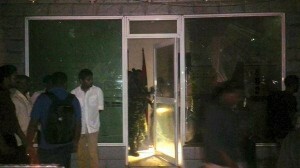 According to the party, the attack came about 15 minutes after staff left the office in Henveiru Sharaasha. 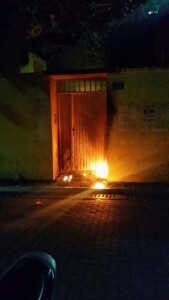 Meanwhile, around 2:15am, the door of former MDP MP Hamid Abdul Ghafoor’s residence was set ablaze. Half an hour later, Hamid received a text warning that he would be stabbed and killed. The fire was swiftly put out before it could spread. An eyewitness saw a lit molotov cocktail or ‘petrol bomb’ hit the door. The previous night (September 24), crude oil was thrown on the house of former President Mohamed Nasheed while the opposition leader was at an MDP national council meeting at the nearby Malé City Hall. The windshield of MDP Chairperson Ali Waheed’s car was smashed with a large rock later the same evening. Hamid told Minivan News yesterday that attacks against the party’s office and members have been frequent during the past eight years. “Since 2005, MDP office has been vandalised countless times and each time we get a forensics team doing some investigation but there seems to be no end to these investigations,” the party’s international spokesperson said. Hamid suggested that the recent spate of attacks might be motivated by Nasheed accusing Adhaalath Party leaders of radicalising and indoctrinating youth to carry out vigilante actions in the name of Islam. “Don’t do this to our youth. Don’t make them do vile deeds after picking them out individually and leading them astray,” Nasheed appealed at an MDP rally held on Monday night (September 22). In a tweet posted yesterday, Nasheed expressed concern with the evident lack of concern from PPM in response to the repeated vandalism of the MDP office as well as the death threats sent to MPs and senior members. MDP MP Imthiyaz Fahmy told Minivan News last week that death threats have become too commonplace to publicise each incident. Eva revealed on social media last night that she had received a text threatening to kill the children of MDP members. “Don’t bring out your children on the streets these days. Stabbing season is about to begin. [We] will kill you,” the message read. Eva noted that the same message was sent to many MDP members while the “govt looks on”. Several journalist were also sent a text message warning them not to cover “the incidents happening in Malé now”, which yesterday included an attack on the Minivan News office and SMS threats to a staff member. “This is a war between the laadheenee [secular or irreligious] MDP mob and religious people. We advise the media not to come in the middle of this. We won’t hesitate to kill you,” read the threat. The text message was sent to journalists from opposition-aligned private broadcaster Raajje TV, Vaguthu.mv and state broadcaster Television Maldives as well as other news outlets. Following the vandalism of the party’s office for a second consecutive night, the MDP put out a press statement yesterday criticising the police’s failure to properly investigate the attacks and apprehend the perpetrators. The statement noted that Wednesday’s nights attacks came after protection was sought from the police. “This party believes that the attacks against the MDP leadership, administrative staff, and property are an uncivilised atrocity committed to eradicate opposition political ideology,” the party stated. The party further contended that statements from government ministers and institutions were encouraging the “atrocities” and increase of serious crimes, condemning the government’s inaction and silence in the wake of the attacks. “The party assures all Maldivian citizens that despite the attacks on the residences and property of the MDP’s senior leaders, the party’s leadership will not back down a single inch and swiftly carry on with our efforts to establish justice and equality in the Maldives, ensure human rights, and strengthen democracy,” the statement read. Expressing concern over progress in police’s search for missing Minivan News journalist, former President Mohamed Nasheed has called on President Abdulla Yameen to take charge of the investigation. Evidence suggests Ahmed Rilwan was abducted at knifepoint outside his apartment in Hulhumalé on the early morning of August 8. Today is the 41st day since Rilwan disappeared. “I call on President Abdulla Yameen to have the case of Rilwan’s disappearance investigated under his direct oversight,” Nasheed told the media after a visit to Rilwan’s family on Wednesday. “Neither Rilwan’s family, nor we, can accept that the government is conducting a thorough investigation into this matter,” the opposition leader said. Rilwan’s disappearance has caused great distress to his family, Nasheed said. “Over 40 days has passed since Rilwan was last seen, and there are certain rituals that we must complete even in the religious regard as we are Muslims. Rilwan’s mother is deeply concerned about not getting the chance to do that,” he said. Rilwan’s disappearance is the most crucial problem facing the Maldives now, he said and called on civil society organisations, political parties, media outlets, the government, the justice sector and the whole state to put in a more concerted effort to find Rilwan. “Abductions are on its way to becoming commonplace. Knife attacks are increasing day after day. Dr Afrasheem was murdered. Before that, Hilath Rasheed was attacked. We do not know the truth behind these and many other such attacks,” Nasheed continued. Police failure to solve multiple cases of violent crime and murder leads to the perception that politicians are involved in violent crimes, Nasheed said. “As I see it, the Maldives is getting a bad name in the international community due to such crimes, and it will affect the tourism sector in future. If we don’t take proper action immediately, our situation will drastically deteriorate in the coming days,” he said. “None of us will cease our efforts to find Rilwan. And I personally will do all possible to assist their efforts,” he said. Rilwan’s brother Moosa Rilwan said Nasheed’s visit had given the family additional strength. “During his visit, President Nasheed spent a lot of time listening to the concerns that our parents have. His concerned has given us more strength. We are now even more determined to keep working until we get answers,” he told Minivan News. Rilwan’s family and friends have announced plans to hold a “Suvaalu March” (Question March) on Friday, September 19, to call attention to police failure to answer key questions regarding Rilwan’s disappearance. “We call on everyone to join us in our efforts. It is important for every individual in our society to stand up against the violence and injustice now rampant in our community,” Moosa Rilwan said. Atleast 31 people have been killed in the Maldives since 2007. Three were killed in August alone. Rilwan’s friend and member of the march organizing team, Yameen Rasheed, said the aim of the walk was to hold the police accountable over failures in the investigation. “As citizens sharing this same community, we have to hold the state accountable,” Yameen said. While the march focuses on shortcomings in the investigation to find Rilwan, it will also raise concern over increase in violent crimes in the Maldives and police’s failure to provide security for citizens, he added.